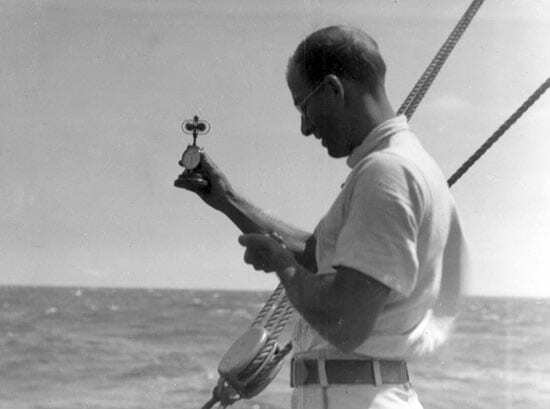 Al Woodcock, perhaps the last man to sail on the maiden voyage of WHOI’s first research vessel Atlantis in 1931, died Feb. 26. He was 99. Woodcock was “a farm boy from Georgia, a high school dropout, an immigrant to Lawrence, Mass., where he worked in the mills and then to Hudson, Mass., where he worked on an apple farm and where, improbably, through the friendship of his boss, he developed a fondness for sailing, and so found himself one day stopping in Woods Hole to get a haircut,” said WHOI Senior Scientist Joe Pedlosky (who married Woodcock’s stepdaughter). While waiting for the haircut, Woodcock asked about the large brick building under construction across the street on the waterfront and was told it would be an oceanographic institution that needed a crew to go to Copenhagen to bring the lab’s new research vessel back to Woods Hole. Woodcock tracked down Columbus Iselin, who was to be the captain of the vessel, and asked for a job. 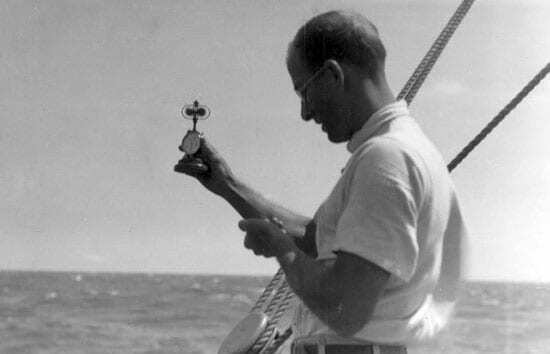 During the 1940s, Woodcock published seminal papers on “Observations of Herring Gull Soaring,” “The Swimming of Dolphins,” and “Sea Salt in a Tropical Storm.” He was the first to observe Langmuir cells and circulation at sea, which helped him explain why the Portuguese Man-of-War sailed to the left of the wind in the Northern Hemisphere and to the right in the Southern Hemisphere by the Coriolis effect. Starting in 1949, he published a series of seven pioneering papers on sea-salt particles and their role in the formation of fog and rain. He even chased hurricanes to collect particles. In an airplane trip over Hawaii in the 1950s with colleague Duncan Blanchard, he is reported to have remarked to a flight attendant that “If God does make it rain, we want to know exactly how He does it.” In 1963, he joined the faculty of the University of Hawaii, a scientifically strategic locale to study rainfall processes.